In my time writing for Sartle there is one lesson that stands out amongst all others: the Dutch know how to party. In correlation with this new nugget of knowledge, I’ve learned that the Dutch masters loved nothing more than to paint drunks and, like your teetotaling friend who quietly judges you at parties, they love to include subtle moralizing messages hidden in the fun. 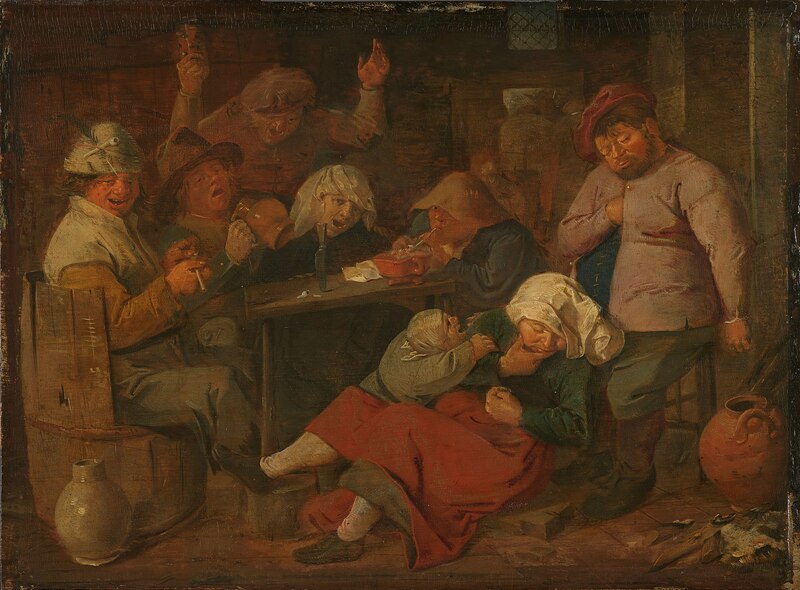 Adriaen Brouwer’s Inn with Drunken Peasants is no exception to this allegorical, alcoholic art. Brouwer’s tender and mocking treatment of his subjects would influence the next generation of more famous genre painters such as Jan Steen. Unlike Steen, who often literally spells out the message he wants the audience to take away, Brouwer uses symbols that are likely lost on the modern viewer. While it’s obvious that a woman so drunk she falls out of a chair when carrying her child is no mother of the year, I bet you didn’t know that this painting is also throwing shade on the men by implying that they are limp lushes or as I like to say, impotent imbibers. Even in the 17th century people knew tobacco was bad for you and it gained a reputation for causing impotence by literally drying you up. It seems that the man with the pipe may want to do some self-reflection before laughing at the #whitegirlwasted on the floor. The literal translation of the title is 'farmersdrinkingparty.' But 'Inn with Drunken Peasants' sounds better, so that is what art historians decided to go with. 4) In the absence of daycare, it is perfectly ok to bring your screaming child to the pub.